Behold one of the worst of the worst on the internet. 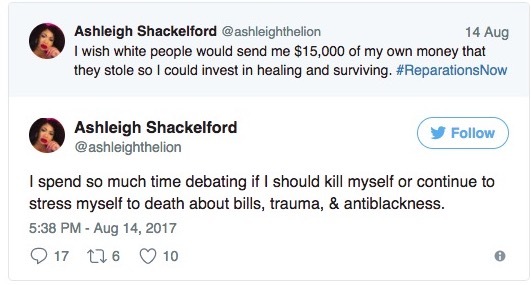 This is a member of the ‘alt-left’. You’re welcome, Media (D). 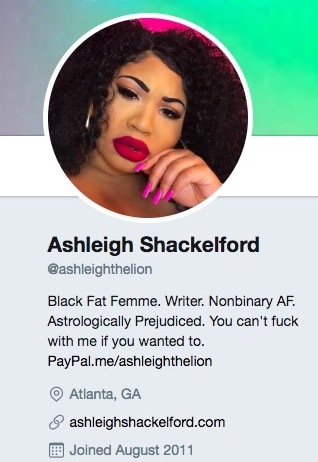 Meet Ashleigh Shackleford self-proclaimed black fat non-binary femme that is a social justice warrior. 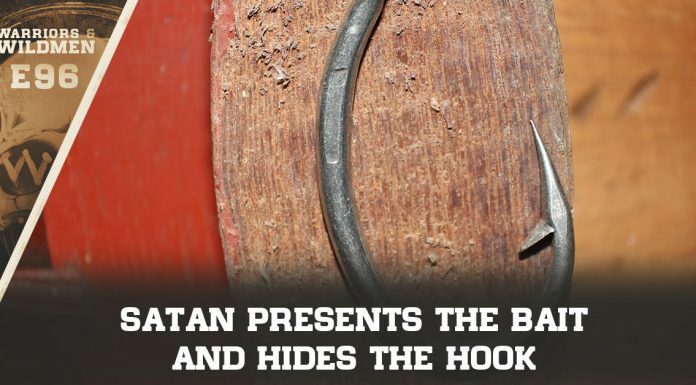 And we could end the article right there, but what fun would that be? 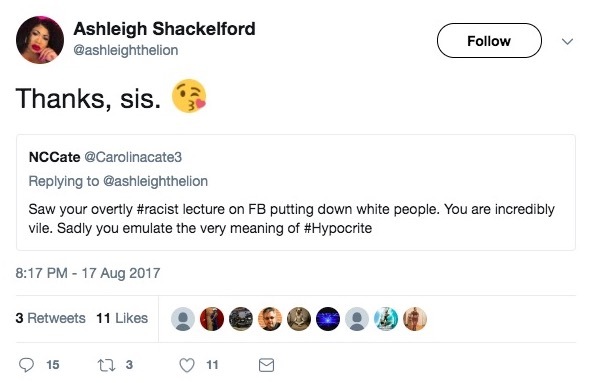 Her tweets are going viral (mostly on the right to show what an @ss she is) because of a video she posted where she was ‘teaching whites’ about racism and their role in it. Many on the left (and the right) have been quick to condemn President Trump for not condemning neo-Nazis, the KKK, and white supremacists enough. 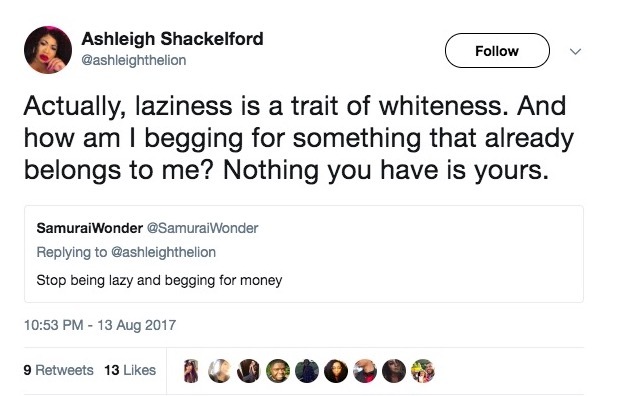 That’s not what Ashleigh is doing. 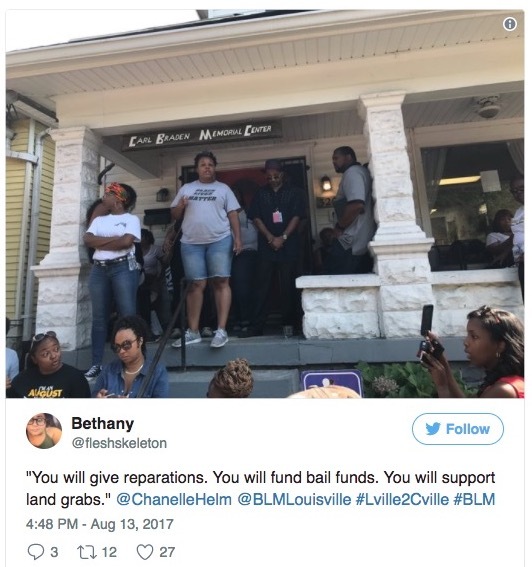 She’s using the riots and fanning the flames of racism as a way to make money. 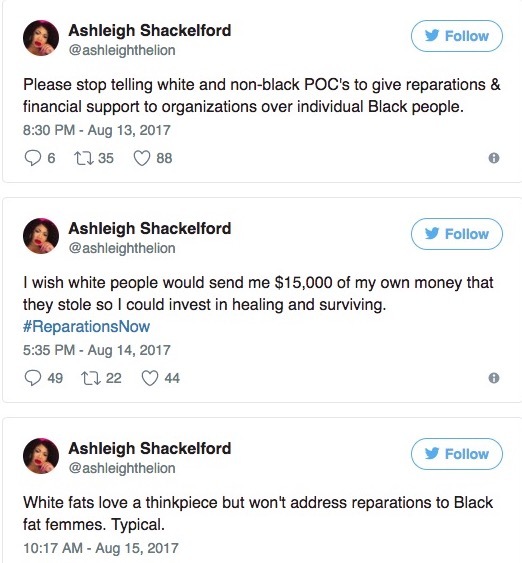 She wants reparations NOW and is using the horrific acts of disgusting racists in Charlottesville to push for it. This chick (?) is something else. 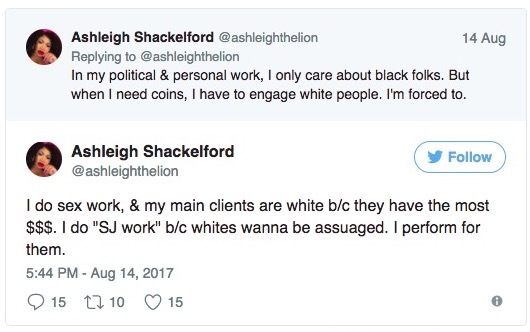 EDITOR’S NOTE: As you can see, Ashleigh has deleted the tweet. No worries, here it is via Desus & Mero on YouTube. 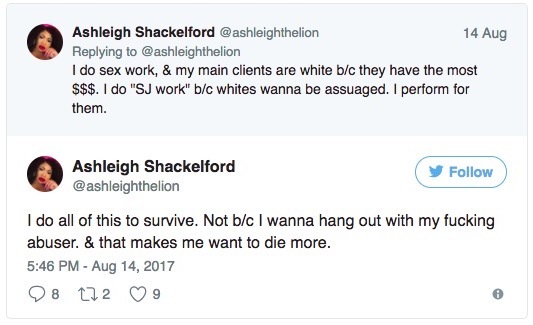 So, how does Ashleigh support herself? And (shocker) it’s not going so well. 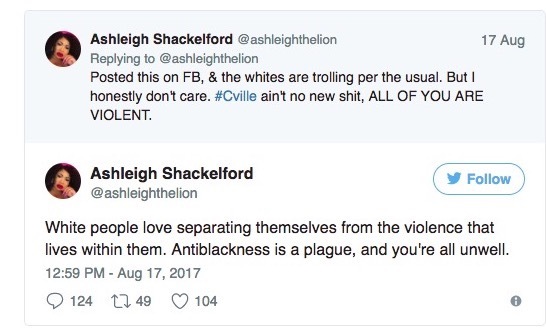 People aren’t actually interacting with Ashleigh on Twitter, because — what’s the point? She’s not going to change her mind. This person is pretty much the Bizarro World version of David Duke in about a mile and a half of black skin. And both need to be denounced. That is what President Trump was bold enough to bring attention to. What did Barry do? He denounced one side and legitimized the other by bringing BLM to the White House. Let me be perfectly clear that there are many within BLM that aren’t racists and just want equality. 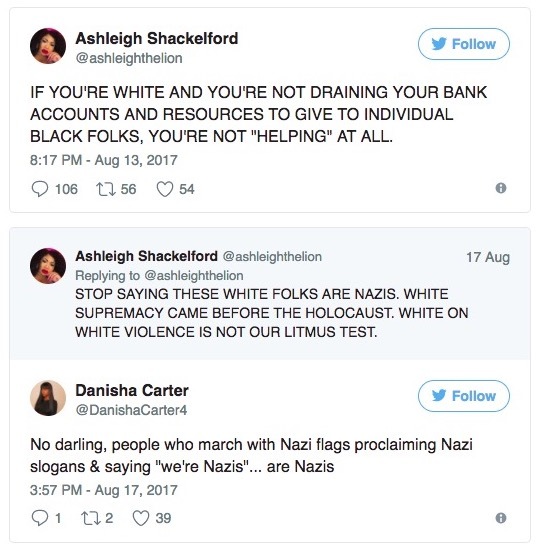 But there are the fringe anti-white elements in there, too. If conservatives are to denounce neo-Nazis, the KKK, white supremacists and bigots of all stripes — as we should — is it wrong to ask the liberals to do the same? Fighting racism with more racism is not the answer. As a matter of fact, it’s blatantly un-American.